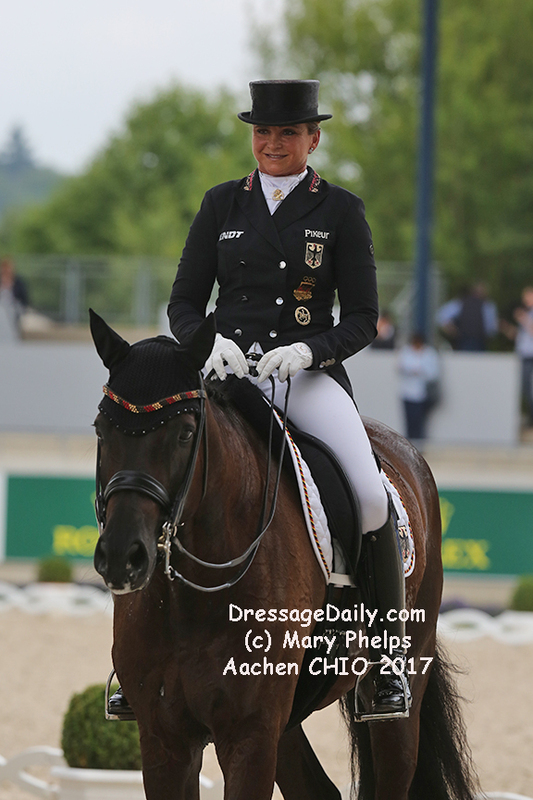 “We are extremely satisfied,” was the conclusion of Germany’s national dressage coach, Monica Theodorescu, after the Prize of the Tesch Family, the first classification in the Lambertz Dressage Nations’ Cup. No wonder as her team has a huge lead. 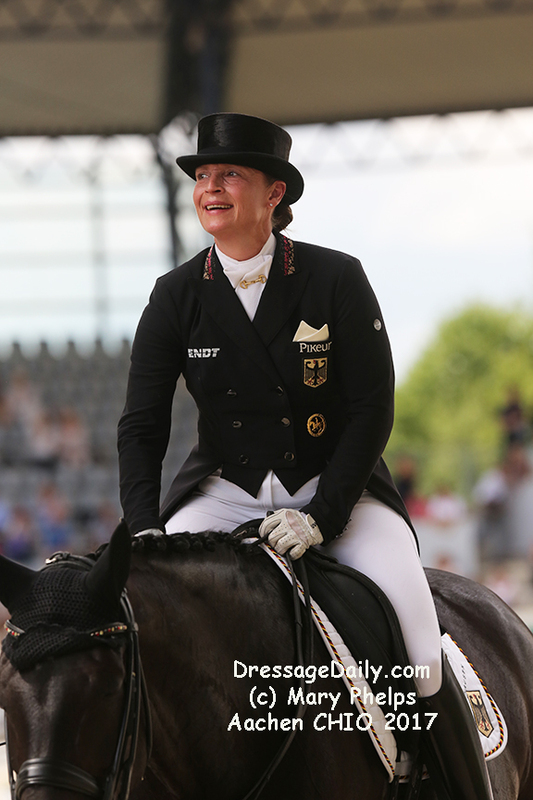 The first team member to ride, Dorothee Schneider laid a good foundation with Sammy Davis Jr. – it was his debut appearance in Aachen (74.529 percent). 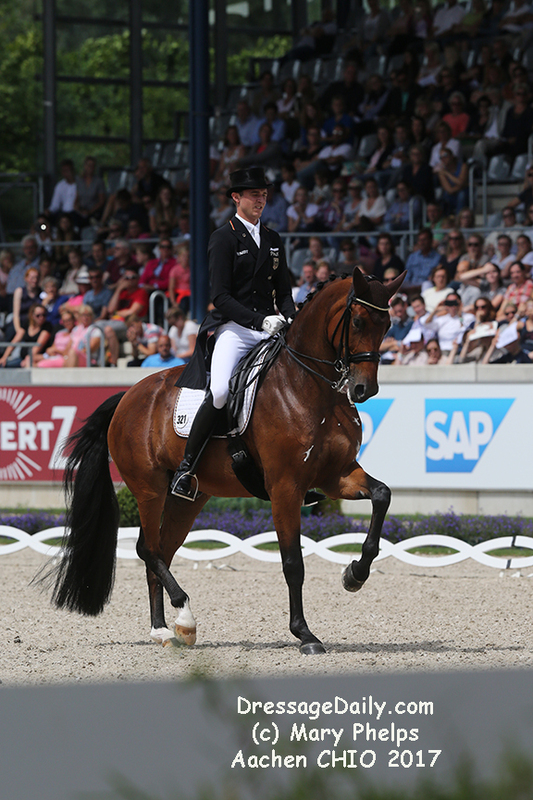 Hubertus Schmidt and Imperio were rather unlucky and didn’t perform as well as expected (71.371). Sönke Rothenberger and Cosmo just missed the 80 percent mark, because the rider had a problem counting the strides (78.757) and Isabell Werth put in a performance with Weihegold that she simply described as “tip top!” (83.171 percent). Thus, the interim overall score of the leading favorites before the MEGGLE Prize, the Grand Prix Spécial on Saturday, is 236.457. 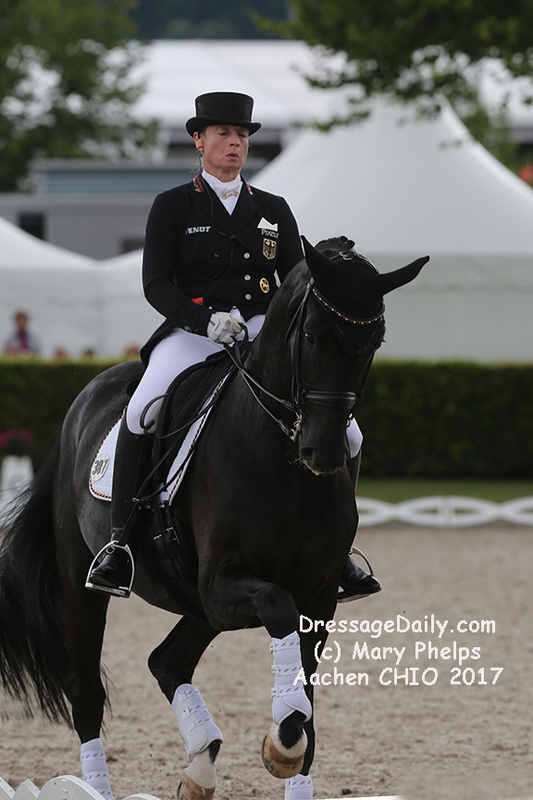 They are followed by the USA on a score of 222.842, for whom Aachen is the highlight of the season. The US team comprises of Adrienne Lyle/Salvino (71.814 percent), Kasey Perry-Glass/Goerklintgaards Dublet (68.929), Olivia Lagoy-Weltz/Lonoir (71.514) and Laura Graves with Verdades (79.514). The Danish team currently lies in third place with an overall interim score of 218.457. Riding for Denmark are Daniel Bachmann Andersen/Blue Hors Don Olymbrio (68.614 percent), Anders Dahl/Selten HW (68.886), Agnete Kirk Thinggaard/Jojo AZ (72.157) and Cathrine Dufour/Cassidy (77.414). Isabell Werth was totally happy with her ride. She said small errors were hers and not her horse. 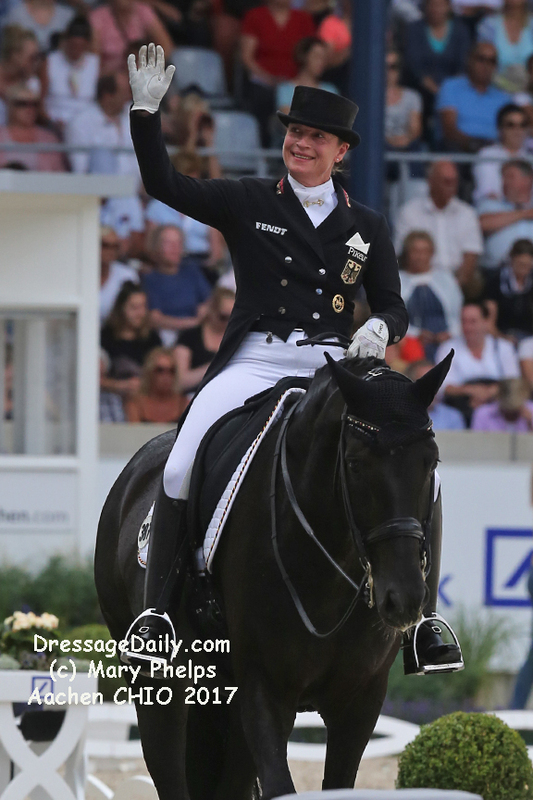 She is proud of “Weihe” alias Weihegold, who she had given a time-out after her victory in this year’s World Cup Final and for whom Aachen is the first outdoor show. “She was absolute focused.” Her conclusion: This is how it can continue! Sönke Rothenberger came third. He wasn’t far off the 80 percent mark with his ten-year-young KWPN gelding, Cosmo. If the rider had practiced the rein-back he might actually have hit the 80-mark, the national coach noted with a grin. And then the team Olympic gold-medallist miscounted the strides in the zig-zag half-passes. “That is doubly annoying, because the marks for this exercise count double,” stated Rothenberger. On the other hand, there were some absolute highlights in his test, i.e. the one-tempi flying changes, which several judges awarded him a 10 for. 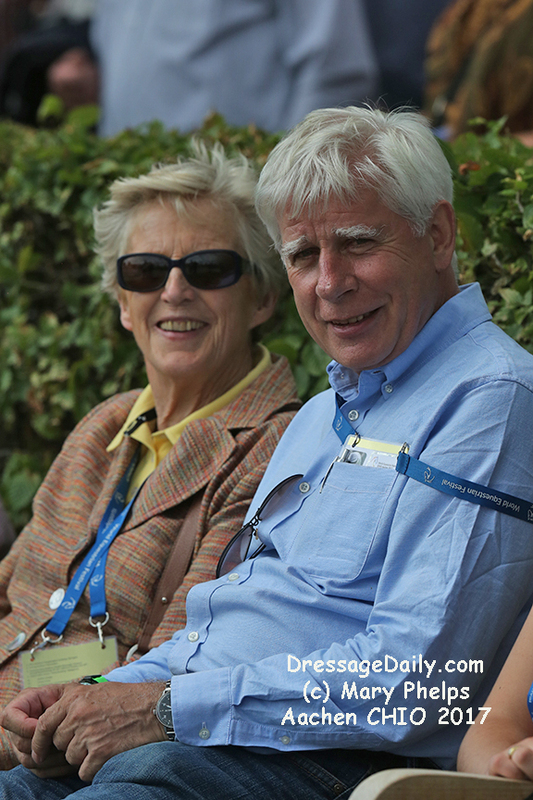 Rothernerger was particularly annoyed as he was hoping to make “The 80% Club” a creation by Dressage-News owner Ken Braddick. “He told me this was his goal.” stated Braddick, who insists the “Club” is just for the results of the Grand Prix. So Rothenberger will have to wait for another show. In her capacity as Chairman of the Judging Committee, Isobel Wessels (GBR) commented that it had been a “most phenomenal day” for her and the other judges, on which even the weaker performances had had their highlights and that overall the modern, harmonious style of riding is winning through. And that in an almost sold-out stadium.